I find this football player to be quite strange looking. I get the impression that he may have non white roots due to his dark curly hair, unusual eyes and slightly projecting jaw. It also maybe possible he has irish roots due to his dark curly hair, blue eyes and pale skin. Oh tiny tim, you silly junior member .Look at his browridges, bi-gonials etc.Looks like a dark haired UP. 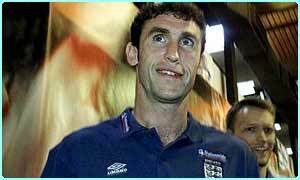 ''Keown'' more usually in the shape of ''MacKeown'' is an Irish name, so fair enough we'll claim this man! Dark curly hair = nonwhite, LOL. Watch pictures of old America and most of the non-Nordish people will tend to look like that- dark haired British UPs. He's not exactly aesthetically pleasing, but not all white people are. He's totally indigenous to that region of Europe, nothing suspicious about him. ok thanks guys, i learn from my mistakes.